What is New Mexico? In the words of Oliver La Farge, "It is a vast, harsh, poverty-stricken, varied, and beautiful land, a breeder of artists and warriors. It is the home, by birth or passionate adoption, of a wildly, assorted population which has shown itself capable of achieving homogeneity without sacrificing its diversity. It is primitive, undeveloped, overused, new, raw, rich with tradition, old and mellow. It is a land full of the essence of peace, although its history is one of invasions and conflicts. It is relief, an entity, at times infuriating, at times utterly delightful to its lovers, a land that draws and holds men and women with ties that cannot be explained or submitted to reason." This is The Spell of New Mexico, an enchantment that has touched and changed the lives of thousands of men and women. D.H. Lawrence called New Mexico "the greatest experience from the outside world that I have ever had. It certainly changed me forever." The writers whose essays make up this book used their craft and talent to try express this profound influence. They include C.G. Jung, Oliver La Farge, D.H. Lawrence, Ernie Pyle, Conrad Richter, and others who found the spell of New Mexico in its high, clear land and sky, its proud traditions, and its people-Indians, Spanish, and Anglo-American. 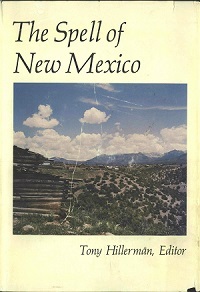 Their essays capture the essence of the New Mexico experience. They are brought together and edited by Tony Hillerman- journalist, novelist, humorist, and New Mexican by adoption- who has spent twenty years trying to understand and communicate the mystique of this "high, dry tag-end of the American Rockies."